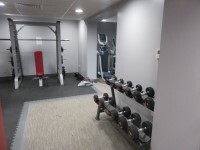 Services / facilities within the building include the fitness suite, bar and function/meeting room, physiotherapy clinic and sports hall. 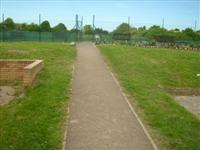 Services / facilities within the grounds include outdoor football pitches and an outdoor bowls green. 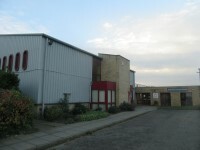 The venue is situated outside the centre of the village. 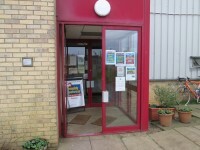 This venue is situated in Redbourn. The nearest mainline station is Harpenden. 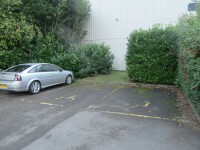 The dimensions of the Blue Badge parking bay(s) are 500cm x 320cm (16ft 5in x 10ft 6in). 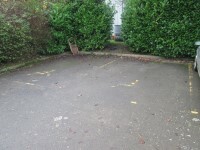 The nearest Blue Badge bay is 20m (21yd 2ft) from the main entrance. The furthest Blue Badge bay is 34m (37yd 7in) from the main entrance. 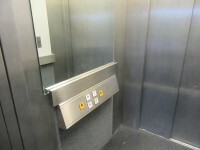 The lift is located straight ahead as you enter. 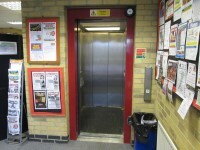 The lift is approximately 4m (4yd 1ft) from the main entrance. The nearest table is 3m (3yd 10in) from the lift entrance. 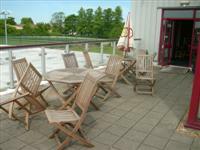 There is an outdoor, terraced seating area which is accessed through the bar. The terraced seating area is accessed through a set of doors which open away from you, are double, heavy and are 140cm in width. You are on Level Change (Outdoor Terrace Area). Skip to the next section. 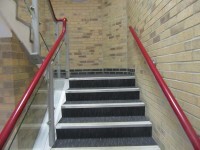 The width of the ramp or slope is 90cm (2ft 11in). 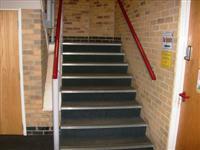 The fitness suite is located on the ground floor, to the right as you enter the building. 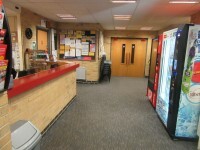 The fitness suite is 5m (5yd 1ft) from the main entrance. Training provided is basic level. 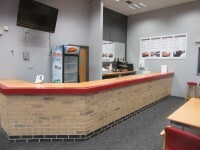 The standard changing room(s) is/are approximately 9m (9yd 2ft) from the main entrance. 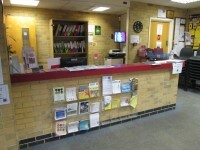 The standard changing room(s) is/are approximately 4m (4yd 1ft) from the reception desk. 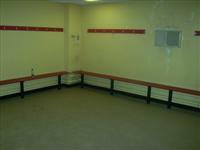 The standard changing room(s) is/are approximately 8m (8yd 2ft) from the sports hall. 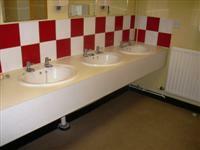 The standard changing room(s) surveyed is/are located within standard toilets. 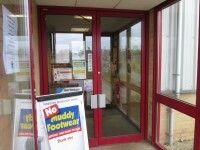 Shower facilities are not available within the changing room(s). 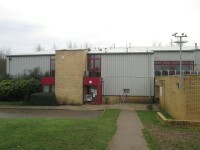 There are additional standard changing rooms located in a separate block to the right of the main building. These changing rooms also have level access standard showers. 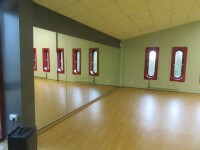 The changing rooms are accessed through doors which open away from you, are double, heavy and are 150cm wide. 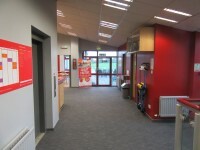 The photographs show both sets of changing rooms. The shower(s) surveyed is/are located within the standard changing rooms. There are identical standard male and female showers. Photograph 1 shows the showers in the main building. 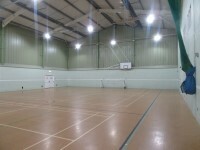 Photograph 2 shows the showers in the changing block for the outdoor sports pitches. 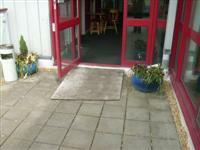 This accessible toilet is located off the entrance foyer. 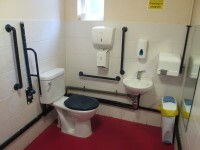 The dimensions of the accessible toilet are 156cm x 200cm (5ft 1in x 6ft 7in). The female toilets are located on the left as you enter. The female toilets are 7m (22ft 12in) from the main entrance. The male toilets are located on the right as you enter. 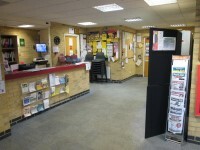 The male toilets are 9m (29ft 6in) from the main entrance. There are additional unisex toilets located on the 1st floor, within the bar area. The photograph on the left shows the outdoor bowling green. 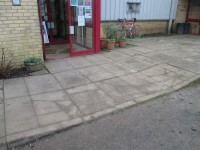 The photograph on the right shows the ramp leading up to the bowling green from the main entrance.